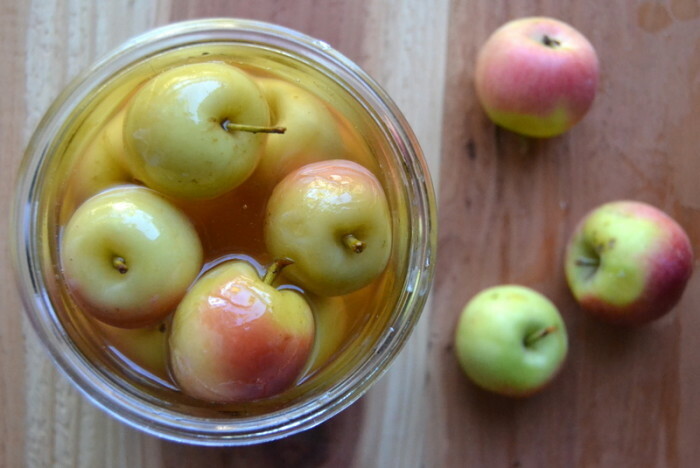 Old Fashioned Spiced Crab Apples ~ I love vintage recipes, they’re a great way to shake things up in the kitchen because they come to you complete with a whole different set of food rules and values. 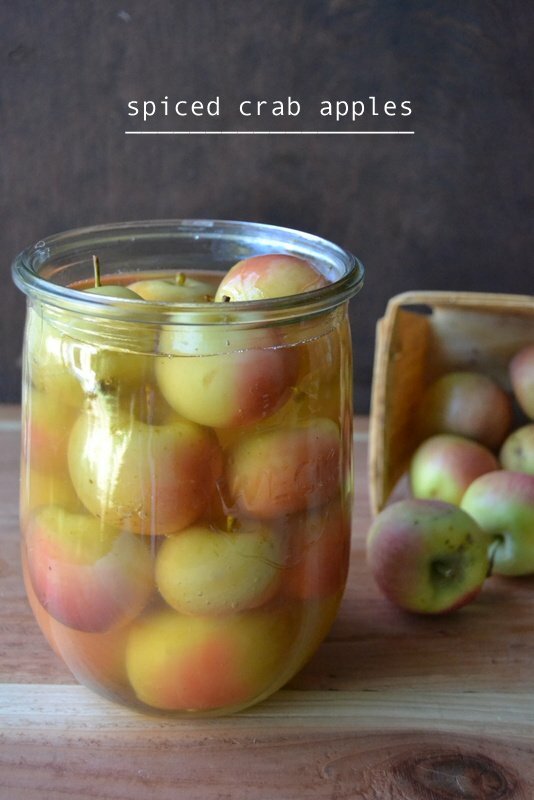 This one for spiced crab apples goes back to the days when families would scrimp and scrounge to use or preserve every bit of food available to them, including the scrawny crab apples from the front yard tree. This is a lovely side dish for any fall or winter meal. Crab apples are usually considered to be too small to bother with, and they’re super sour if you bite into them raw, so most people leave them for the squirrels. But the pretty flowering trees are common in yards, and come in lots of varieties, from the teeny tiny, to the ones I found, which are more like small apples. In fact the difference between a crab apple and an apple is just size…under 2 inches is considered a crab apple. And while you can’t really make a pie with them, they have lots of natural pectin, so you can make jelly, or they can be pickled, or ‘spiced’, and then they make an unforgettable side dish. Growing up I remember spiced pears always showed up on our Thanksgiving table, and these crab apples are basically the same thing. The apples simmer briefly in a sweet tart and spiced pickling liquid which softens them and allows the flavors to penetrate. You need to prick the apple skin with a fork so that they don’t split open as they cook, but there’s no peeling or coring necessary, the whole little fruits will get packed in the jar. I’ve updated the recipe by using cardamom and cloves instead of the typical cinnamon and they give this a vaguely exotic feel. Actually it reminds me a little bit of chutney. You’ll want to find a large, wide mouthed jar for this project. My WECK JAR held almost the whole quart of apples. 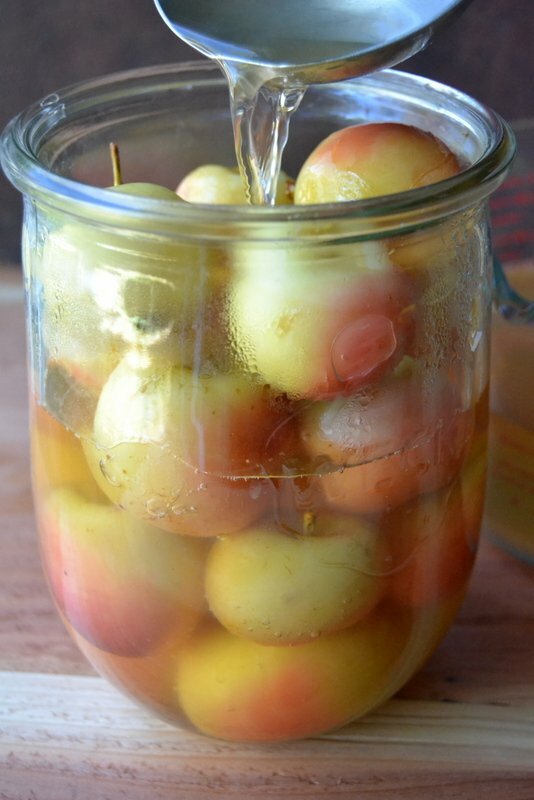 You can also use smaller jars if you have smaller crab apples, just make sure whatever you use can accommodate your fruit. I did a dry run first. The apples will be ready to eat after a day, and will keep up to a month (or more) in the refrigerator. Serve them as a traditional side to meats and poultry, or sandwiches. I think they’d be fantastic on a cheese plate, too. Wash the apples well, and leave the stems intact. Gently prick the apples all over with a fork or the tip of a small sharp knife. This is so that they don't burst as they cook. Combine the vinegar, water, and sugar in a pot. Turn down the heat and add the apples to the pot. Simmer for about 5 to 10 minutes, depending on the size of your apples. 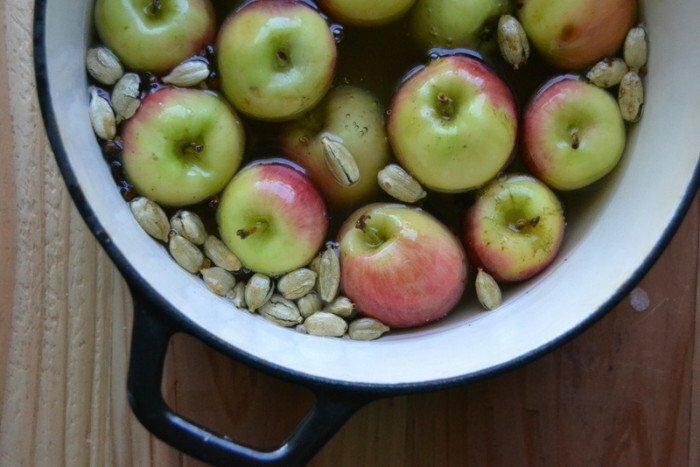 Use your judgement, you don't want the apples to get soft and mushy. Carefully remove the apples from the hot liquid and pack them into your jar or jars. 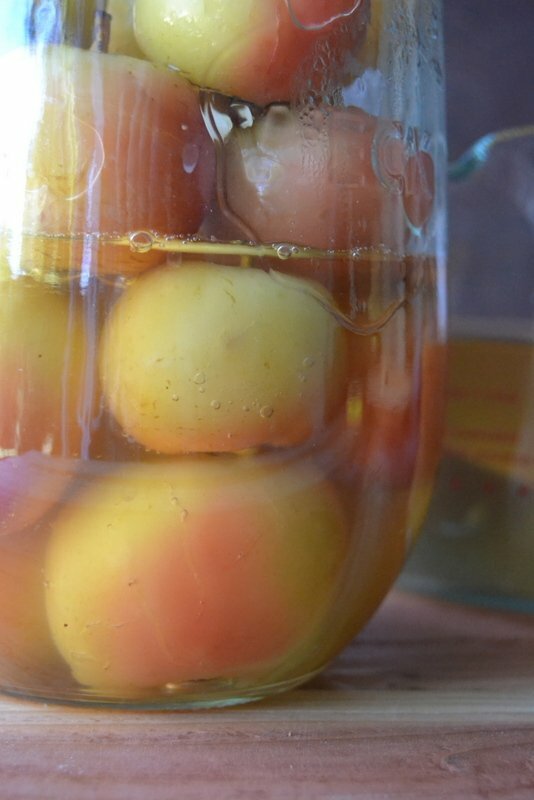 Strain the pickling liquid and then pour into the jars, completely immersing the fruit. Let cool and then cap and refrigerate. The apples can be canned, as well, for longer storage. These are really really delightful! I hope you check out your neighborhood for crab apple trees, they’re in season right now, and If you want to know more about identifying and using crab apples, the best information I found is here, it’s from Ireland, but the info pertains to the States, too. Don’t forget to pin these Old Fashioned Spiced Crab Apples! and cook from frozen , with added spices ? I know you can freeze crab apples, but I’ve been taught to remove the stem and blossom ends first. I would like to know how much the recipe for the crab apples is for? Is it for a dozen jars..? This is a small batch, makes about 1 quart. I filled my 1 litre Weck jar. I went to Crate and Barrel and the largest Weck Jar I could find was 26oz. Looks small. What size of jar are you using? Mine are the 1 litre size, you can see them HERE. It’s hard to find all the sizes out in retail, so I rely on Amazon. Like most people, at least in America, I grew up believing all crab apples were super bitter and gross out of hand, but that all changed when I found a beautiful little cherry red crab I just couldn’t believe would be completely nasty so I tried it. To my surprise while it was tart, it was also nicely sweet and tasty! No one touched them so I picked every single one I could reach. That started me tasting every crab I found, most were inedible fresh, but soon I found an odd oblong solidly red crab, and truly, if they were full sized it would be my hands down favorite apple!! Every tree i find goes on a list so I can find them no matter what happens to whatever tree I normally pick. Honestly even though you don’t get much fruit eating them right off the core, about a 1/4 of what I harvest I can’t help but eat straight up!! 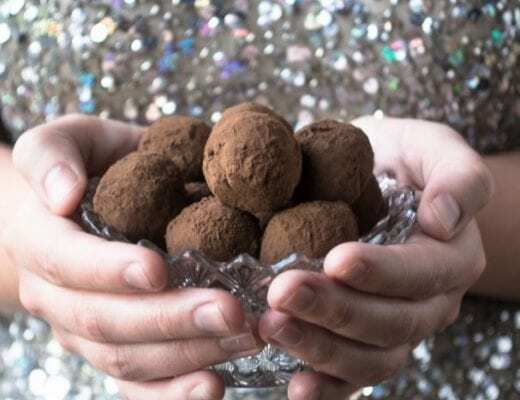 So they are totally worth tasting, you never know what you’ll find. We think they’re called “John Downies”, just FYI. The best applesauce I’ve ever tasted were made from those little beauties as was my favorite fruit curd. This year I’m going to try making a small pie from them. I’ve made a couple of different pickled crabs and they are great. I’ll give these a try too. You can totally can jar/can these, but it is always smart to check the proper proportions first obviously. Some will split, I haven’t yet figured out how to keep that from happening all the time. Mine were cooked in the syrup for 5 mins, then removed into the jars and the was syrup reduced before pouring into the jars. I then water bathed them for 5 minutes only as I didn’t use huge jars and I didn’t want them mush. They were soft once finished, but not to soft to eat, however don’t take my timing to heart anyone, because technically I think they should have been processed for about twice that. A year later they were still fine, but again, a little research will give the proper numbers. I honestly don’t know what would happen if you didn’t pre cook them, I think you likely would get a less spiced version if you did that. But crabapples are totally worth the harvest and often easy to find as few other people pick them. Love this Sarah ~ you’re a true crab apple aficionado :) I’m going to have to look up your ‘John Downies’ ~ they sound incredible! How long to process after making the recipe (as in how to can them..) ? Hi Julie! I am about to try this recipe, because it looks fantastic. I will definitely be canning the crabapples and so my question is — do you think that I would need to cook them before canning? I was thinking I would just pack them in sanitized jars raw, bring the pickling liquid to boil and then do a 10-15 minute process. I worry if I cook them first, it will go to mushy land. I am planning to use larger crabapples and I do find they break down pretty fast. Jut wondering what your experience was if you have preserved. Many thanks – and love your beautiful site! Hey Andrea ~ so, I haven’t canned these, but I would think it’s best to cook the apples, at least a bit to soften them. (Remember to prick them first, that helps them stay intact.) The recipe that I adapted was an old one that was originally canned, so it’s probably ok, but the main thing with canning is that the chemistry has to be correct for safety, so I don’t like to give directions if I’m not 100% sure. I did read that canned crabapples are usually water bathed for about 30-35 minutes. You can check out this recipe ~ https://nchfp.uga.edu/how/can_02/crab_apple_spiced2.html for the proportions of vinegar and sugar they used. Thanks for the clarification Sue (and I am sorry I called you Julie!) I will check the specs for canning and report back. I’m wondering what proportion honey would be if replacing the sugar in this recipe? I’m not sure Julie, you might try adding it to taste. 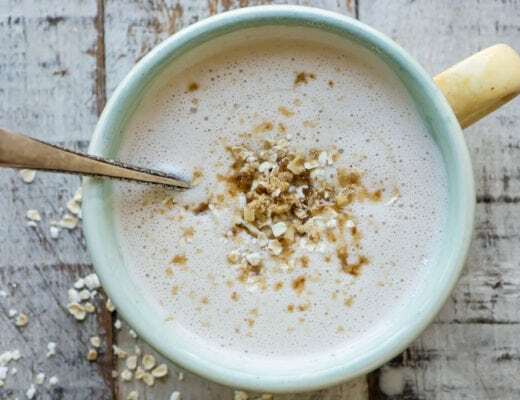 As a general rule honey tends to be sweeter than sugar so you could start with half the amount of the sugar in this recipe, and work from there. Its right into Autumn where I live, and yesterday, a neighbour gave me ‘branches’ of Crab Apples laden with beautiful tiny red fruit. I now have about 8 kilo’s of Crab Apples sitting on the kitchen table, waiting for me to do something with. I have to make some of Granny’s Crab Apple Jelly… (memories as a child, sitting in Granny’s old fashioned country kitchen in Surrey England} But I’m going to have a go at these spiced apples. Living alone & plenty of organic veggies at my back door…and reaching my life’s ambition to cook from scratch…and preserve everything I can… I sometimes, instead of cooking a meal, I serve up, for myself a plate of anti pasta. I recon Spiced Crab Apples, would go down a treat, home made cheeses, olives, roasted tomatoes…. etc a bottle of red, a good old classic movie, wood fire burning. I can picture me now… laid back on the recliner, movie playing, eyes closed, mouth open, empty plate and wine glass. Probably not a good look. But who cares…. 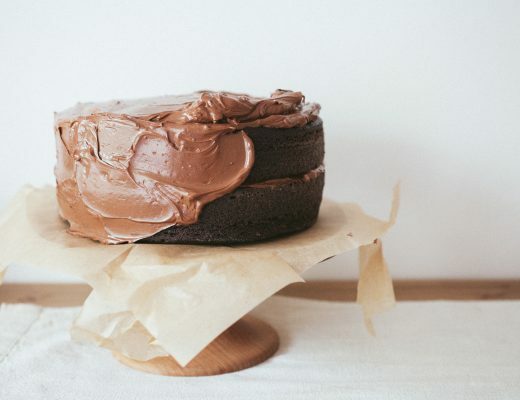 Thankyou for sharing this recipe. Susan, High Country Victoria, Australia. love this comment Susan, I think you paint a perfect picture, and you made me very hungry! You’re so lucky to have such a nice neighbor, I hope you enjoy these. do you sell them already in a jar ???? No, this is just the recipe, Francoise, sorry! I came to this site expecting the vintage recipe. Would have appreciated the original recipe alongside your variation of cloves and cardamon. This recipe is pretty much identical to most old versions, Janine. I think the only difference is the use of cardamom. You can sub min cinnamon for a more classic flavor. You would serve these as a side dish, Zeynep, they would be perfect at Thanksgiving, for example. makes a bought 3 cups ! simmer gently until the apples are soft, stirring occasionally to be sure the fruit doesn’t catch on the bottom of the pan. remove it from the heat and leave to cool. 2. remove the vanilla bean, then puree the apples by pressing them through the fine disk of a food mill or a sieve, collecting the resulting puree in a bowl. scrape the seeds from the vanilla bean pieces with a sharp knife and ado them to the apples along with the bean. add the other ingredients, pouring the eggs and yolks through a sieve. 3. place the bowl over a pan of simmering water ( or use a double boiler ) and heat gently, stirring all the time, until everything is blended and the curd begins to thicken and coat the back of the spoon. this stage should take abought 20/30 minutes. 4. removethe vanilla bean pieces. I can’t wait to try this, thanks Tarnie ~ I’ve never heard of an apple curd!! How to to this using pressure cooker. Are these of the shelf life of refrigerated pickles, which from my understanding is about 3 weeks? Making applesauce from crab apples is definitely challenging! I think you would have to remove the stems, halve the apples and remove the seeds and core, and then make the sauce WITH the skin on. The skin is healthy and shouldn’t be a problem for your grandson. It will give the sauce a nice color, too. Hope this helps! Another option is to invest in (or borrow!) a food mill. We live in Northern Canada where all that grows is crab apples and food mill is a great investment. All you need to do with the crab apples are throw them in a pot with a cup or two of water and let them simmer on low until they are very soft. Take them off the heat and let them cool, and then put them through the food mill. I just put a 5 gallon pail of tomatoes through my mill, so if you also make your own tomato sauce it can to double duty. That’s cool, Christine, I should look into getting one. I have a little hand held crank style one, but this one looks pretty heavy duty! I’m so glad you found this, Matt, let me know how they turn out. I have more crabapples than I know what to do with. So you really DON’T have to core them … do you eat it core and all? Thanks for the recipes. No, I left them whole, and yes, you really can eat them core and all. Alternatively you can eat around the core when you slice them. Hi Sue: Is there a particular crab apple variety that you would recommend using for best flavor? What is the variety you used for this batch featured? I think any variety that you find will work, Cristina. Mine were on the large side, but the smaller ones will work too. Just updated, thanks for spotting that Jo! Thank you for this. I actually have a jar of this beautiful looking preserve. My grandmother used to do this! I loved it as a kid, it is so delicious with cinnamon stick added to the brine. By the way my Mom used to freeze quartered Crabapples, the rescue type which is a beautiful red crabs for pies, She left them unpeeled, froze them uncooked and loved the color for strudel, cinnamon rolls and pies! Great tip on the freezing, there are so many crab apple trees across this country, it’s nice to hear about another way to preserve the fruit. Thanks. I completely messed up your recipe (no convenient cardamom) but the are STILL delicious after compensating with cinnamon. I had a LOT of apples and can’t wait to put them on EVERYTHING! Sue, what a beautiful blast from the past! I haven’t seen an old-fashioned spiced crab apple since my mother died. She is the only person I know who made and served them. I think she served them during fall and winter. Must make these if ever I can get my hands on some crab apples. Yay for crabapple recipes – I’ve been looking for recipes that don’t involve making jelly, and these pickled ones sound delicious. I find antique recipes fascinating, too. OMG! you are about 1 month late for my tree! I will do this next year. We have so many crab apples, our lawn smells like it is fermenting! And i used to love those dyed red ones my mom would buy every Thanksgiving! Thanks Sue! An interesting recipe! Those apples must taste wonderful. What a great vintage recipe, love the cardamom and cloves! I was tempted to use several more different spices, but I’m glad I held back, just the two gave it a wonderful vibrant spice flavor, I was surprised! The jelly would be great, too, they have so much natural pectin, and the color is gorgeous, especially if you have the small pinkish crab apples. Oh my gosh I love this idea! Growing up there was a big crab apple tree in our yard and to get rid of them, my dad and I would hit them with a baseball bat down into the woods. It was a mess – and really fun! Probably would have been better though if we had tried to salvage a few for eating :-). What a great idea, Sue. 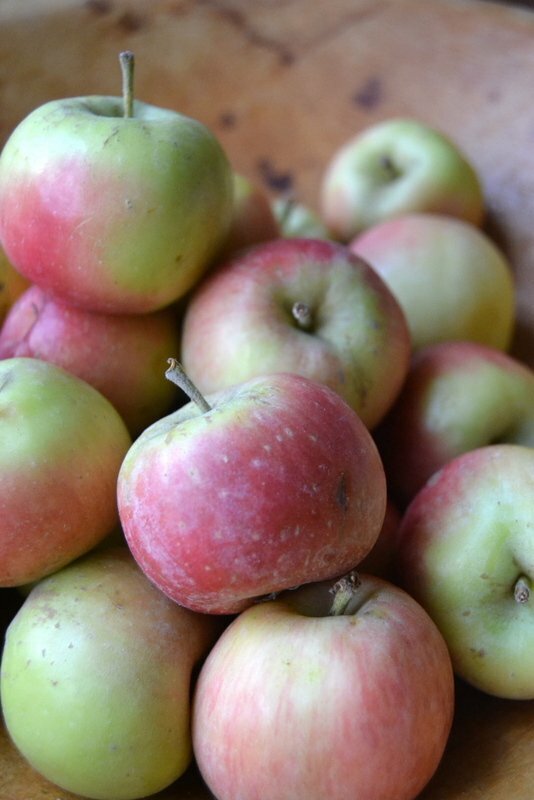 When I lived in Michigan we had lots of crab apples…I made applesauce with them. Wish I’d thought of this! I made jelly with the small ones from a friend’s tree and it turned out the most beautiful shade of pink…I bet your applesauce was beautiful!